It’s hard to find a bad location when in the Interlaken area. The train is a 8 minute walk to get to and then you can take off from there to go exploring. The rooms are dated but clean and large. The folks that work there are very nice. We did have a large party that kept us awake in the restaurant but when I went down the tell them they made arrangements to lessen the noise. I would stay here again. Location was good .. the hostess was very nice .. treated us very well and provided all the information needed .. good breakfast..
Great location, comfortable bed and fantastic staff!! Had a bar n restaurant with daily special menu .... well priced, home cooked meals . Breakfast included and was ok for the price . Hotel is located within 5 min walk from the lake. And 1 min walk to the bus station. Line 102 serves the rout and bus to Interlaken goes every 09 and 39 min of an hour. It takes 5 min to Interlaken by bus or 35 - 40 min walk. Staff of the hotel was really helpful! They did all their best that I enjoyed my stay with them! I got info about bus schedule, about things to do, basically everything I needed! My single room was small but perfect for 1 person and totally met my expectations, it was clean and even overlooking the road was quiet during the night since it is no heavy traffic there during night. Ah.. and coffee at breakfast was just wow!!! We had an early start so requested for breakfast at 6.30 AM and they made it available for us. The owner is an exceptionally pleasant woman whose demeanor compensated somewhat for the rather underwhelming facility. The dinners are reasonably priced, of significant portion and tasty. Dinner orders end at 8:30p, so plan accordingly. I travelled in peak season and paid a reasonable price for the accommodation. Sufficient breakfast buffet is included in the price. The chalet-style Hotel Bären in Ringgenberg is about a 10-minute walk away from Lake Brienz and 2 miles from Interlaken. It has a sauna and offers free Wi-Fi and free parking. All rooms have an private bathroom and are equipped with a cable TV. Fine Swiss and international cuisine is served in the Alpine-style restaurant. Situated in the center of Ringgenberg, the Hotel Bären is an ideal base for trips in the Bernese Oberland and to the Jungfrau region. Up to three children under 12 years are charged CHF 35 per person per night for extra beds. 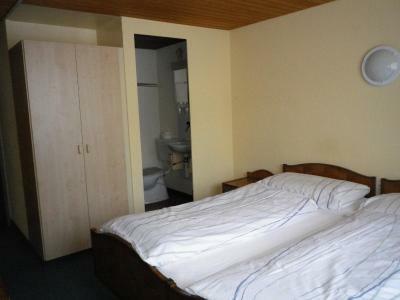 Up to three older children or adults are charged CHF 60 per person per night for extra beds. The sauna is available during wintertime only. The hotel is quite strategic. Not really far from the Interlaken and very near to the lake. The view around this hotel also nice. Alas, the facility is dated and it shows. Though there is a lift, it only services the main hotel and my room was not located in the main building. I stayed in another building behind the main hotel on the top floor. One of the employees had to help me carry my luggage up two flights via the stairs. The carpet is dated, the hallway lights have to be manually lit at night and the hallway light switch by my room was broken. My single room was quite large but only had two electrical outlets - one for the TV and one over the sink (which I used for the fan - it was summer and hot, no A/C). Charging my phone or tablet or using the hair dryer required losing either the TV or the fan. Dilemma :-). TV is a small 13" and the only English-language channel I could access was CNN. Keeping the windows open for ventilation subjected guests awakening to the sound of large tour buses in the adjacent parking lot early in the morning. The hotel provides public bus travel cards (as an adjunct to the city tax assessed separately) and is four stops from the main depot at Interlaken Ost on Bus #102. Buses run 2x each hour until 9p, when they run hourly until 11p. The bus stop is about 1.5 blocks from the hotel. Did not cause too much of an inconvenience as most local attractions close early and most restaurants are closed by 10p. Bathroom & shower are tiny. Door to bathroom did not clear toilet. No toiletries are included save a soap dispenser in the shower, but since the sink was located in the main quarters, washing your hands required getting soap from the shower dispenser and carrying it to the sink. An old building with local style looking. Very kind and helpful owner and staffs. Cleanliness Parking Environment. Good view on mountain Breakfast there is a small supermarket in front of the hotel. That's very useful. Hotel has a restaurant offering some simple local dishes. 3 kms away from the centre.